Oracle set its sights on a bigger piece of the cloud pie Tuesday with new IaaS services that put it in more direct competition with Amazon Web Services. 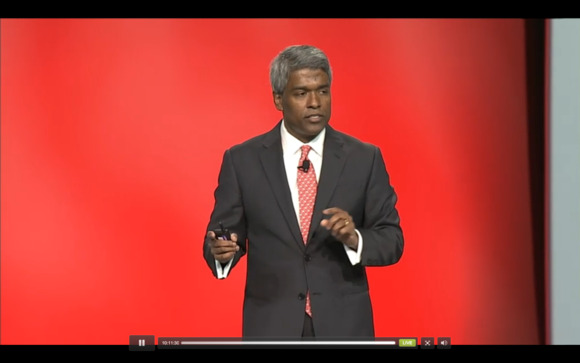 The new IaaS services were introduced by Thomas Kurian, Oracle's president of product development, at its OpenWorld show in San Francisco. First, Oracle Elastic Compute Cloud allows customers to chose between elastic and dedicated compute options. Elastic Compute offers the ability to run any workload in the cloud in a shared compute zone, while the dedicated option adds capabilities such as CPU pinning and complete network isolation. Compute Cloud supports a variety of operating systems, including Linux and Windows, and features robust monitoring capabilities, Oracle said. Two new Storage Cloud services, meanwhile, focus on different types of storage. An archive option provides storage for applications and workloads that are accessed infrequently and require long-term retention, with predictable SLAs for data retrieval. A File Storage service, on the other hand, offers file-based NFS v4 network protocol access to both Object Storage and Archive Storage tiers in Oracle Storage Cloud Service. Oracle Network Cloud is designed to provide secure and high-performance connectivity from customer data centers to the cloud following a software-defined network configuration approach. Connectivity options include VPN, Oracle Cloud Connect and network bonding. A Container Cloud offering allows customers to run applications within Docker containers, which can be easily deployed within the Oracle Compute Cloud. Finally, Oracle and its partners have certified a number of technology stacks on the Oracle Cloud; they're available in a standard service catalog to simplify deployment. The new offerings "really help round out Oracle's IaaS solutions portfolio," said Charles King, principal analyst with Pund-IT. They include the kinds of "more or less generic" compute, storage and networking capabilities available on major public clouds, King noted. At the same time, though, "Oracle is also making good on delivering key parts of its application portfolio via the cloud, including the eBusiness Suite, PeopleSoft and JD Edwards solutions," he pointed out. "That should stir the particular interest of existing Oracle customers, and could also tempt businesses already considering deployment of those solutions," King said. The extent to which Oracle's new IaaS offerings will compete with AWS, meanwhile, "largely depends on two issues: pricing and perceived security," King noted. Oracle customers can already run many or most of their applications on AWS without any additional license fees, so "unless Oracle decides to add a sweetener of some kind to its new services, it may be difficult to tempt customers already using AWS into its own IaaS fold," he said. Similarly, "though it's common for IT vendors to pitch their own cloud platforms as being somehow inherently more secure than public cloud platforms like AWS, that could be a double-edged sword for Oracle," King suggested. "If the company were to pursue that line, customers might ask why the company was collaborating with AWS in the first place."